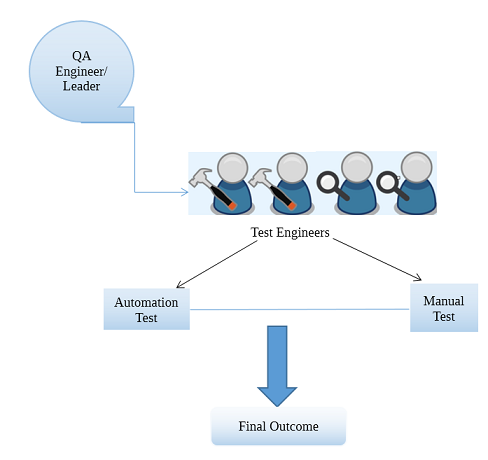 The role of a QA leader is that of supervising the testing activities of a software system under the scanner. Being a leader, QA has the prime responsibility of carefully planning, organising and monitoring the testing activities. The QA leader understands the importance of delivery of the software product on time. The major objective lies in the fact that the end product must be of high quality. The size of a project under consideration , may range from small to large. Quality has a good indulgence in validating and verifying a software product. The two most important questions that underlies the entire activity cycle of a QA leader is to provide a structured answer in two dimensions- are we building the right product, is the product being built correctly? Cross referencing the requirement specifications, constant urge to improve are the major focus areas. It is imperative that a QA leader possess excellent leadership skills, have the right acumen to drive the project in the appropriate direction. Timely amendments to the system complying with testing requirements is a quintessential factor for a QA leader. Following are the few key areas that highlight the role of a QA leader in greater detail. Defining an objective and set a goal that is to be achieved by the testing team. Defining the standards upon which the current project is to be measured and analysed. Timely review and analyse the progress of the testing of the software product as per the defined parameters. Keep a check on the progress of the project, by monitoring the test plan execution. Setting up a mission and work on the planned activities for the testing phase. Ensuring that the development tasks meet the quality criteria. Most importantly, adherence to the deadlines is essential. Monitor the task of the test team to assess that they are moving in the right direction. Fill up the gaps , if there exists any deviations between the defined parameter and actual parameter. Coordinating with the testing team to ensure proper communication exists within the team regarding the working. Reviewing the status of the ongoing test activity. Collect progress report from managers of respective team. Finding risk involved and generating a solution for the same. Sending report to the higher management. Apart from the aforementioned duties, a QA must also possess skills in other areas. Domain specific knowledge: A QA must have excellent knowledge about the technology being used to develop a specific software system. Tool Expertise: various tools are used in the process of software testing phase. A QA leader plays a vital role in carrying out software quality assurance. Being a leader, his prime responsibility is coordinating with his team members. The onus lies on the test lead professional to strategize software test planning and deliver an efficient and robust end product.